Keilor is a residential suburb on the Maribyrnong River, 16 km north-west of central Melbourne. It was also a municipality comprising several residential suburbs larger than the Keilor township, along with outlying rural areas, from 1863 to 1994. Keilor has two significant archaeological sites. In 1940 a worker in a quarry near the junction of the Maribyrnong River and Dry Creek unearthed a cranium. Since then stone tools and charcoal from an Aboriginal fire have been recovered, and radio-carbon dating puts the remains at about 14,700 years. Further evidence extends occupation to 30,000 years ago. The second site is at Green Gully, where stone artefacts have been found. Keilor was named by James Watson of Leith, Scotland, who arrived at Port Phillip in 1840, naming the place where he settled after the property on the Chapel at Keilor, owned by his father in Scotland. (He later settled at Heidelberg, and Rosanna is named after his wife). The road to the gold discoveries at Castlemaine and Bendigo (1851) crossed the Maribyrnong River where Keilor was situated, just one year after quarter hectare land sales had occurred. Two years before the gold discovery William Taylor purchased the property that became known as Overnewton (the place where his father lived in Scotland), occupying an area stretching from immediately west of Keilor township to beyond the future municipality’s western boundary. The heritage listed Overnewton homestead (1849-59), is off the Western Highway about 2 km from the town centre. The Western Highway in Keilor crosses Steele Creek and the Maribyrnong River, and each required large bridge works in the 1850s. The steep gradients of the river valleys were conducive to stopping places for wagons and travellers, Keilor village was gazetted in 1850. 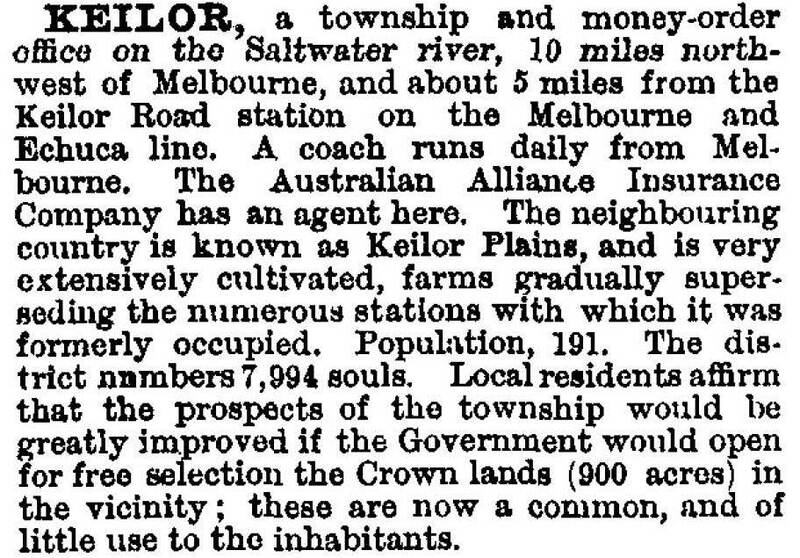 On 3 March 1863, the Keilor Road District was proclaimed, with its eastern boundary adjoining Essendon and its western boundary adjoining Melton. Keilor was described in 1865 as being situated in an alluvial basin formed by the Maribyrnong River with a court, post office (1854), the Keilor and the Waggoners’ Arms Hotels, and with access to plenty of water power from the river. The surrounding country was known as the Keilor plains. The township had about 250 people and the Road District about 1500. The Anglican and Catholic churches opened schools in 1853. The permanent St Augustine’s Catholic church was opened in 1863 and the Anglican Christ church in 1877. The road district became a shire in 1871. The Keilor plains were used for pastoral, dairying and hay production. Once over Curly Hill where the road crossed the Maribyrnong’s steep banks, the roads were good for cycling for an afternoon’s rabbiting at Sydenham. 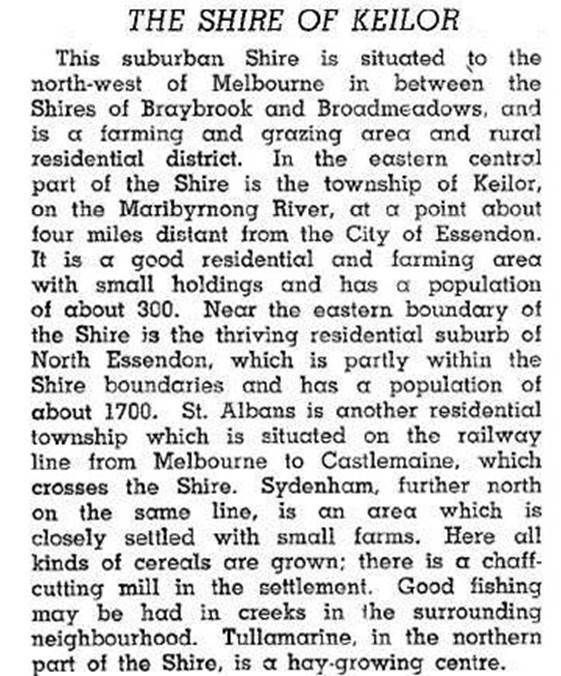 Donald Macdonald (1859-1932) nature writer and ‘Argus’ journalist wrote an account of the Keilor village which was published as ‘Village and farm’ in Gun boughs and wattle bloom gathered on Australian hills and plains (1887). Macdonald attended Keilor primary school. He described Keilor as deep set in the hollow of the plain, overlooked by hill tops capped with grey basalt. The houses were homely and comfortable, with faded paint, ivy and honeysuckle. Exotic trees were extensively planted. In the centre was a large lagoon (now a reserve), and the political centre was the blacksmith’s bench. Scotch and Irish traditions predominated. Overnewton’s 10,000 acres were broken up for closer-settlement farms during 1905-21. Keilor shire’s closer settlement urban growth was at St Albans, on the southern shire boundary, where a railway station was opened in 1887. The shire’s western boundary at Essendon where Bulla Road once passed through the Essendon Airport, also had residential development at Essendon North (1920s) and Niddrie (1950s). Near Niddrie, Airport West was developed in the 1950s, a mixture of residential and industrial properties. The tram to Airport West extended from Keilor Road in 1943. Beginning in the 1960s residential development outwards along Keilor Road and the Calder Highway began to reach the edge of Keilor. The name was bestowed on several suburbs – Keilor East, Keilor Lodge, Keilor Park, Keilor North and Keilor Downs. Keilor North is mostly open space, comprising a golf course and the heritage listed Organ Pipes National Park on Jacksons Creek. The Organ Pipes are a unique geological formation of basaltic columns and small tessellated pavements beside the creek, which has steeply incised the plain. Keilor township is relatively small in area, transected by both the Old Calder Highway and the Calder Freeway. In addition to the original primary school there is St Augustine’s school (1979). A second State primary school, Calder Rise, operated from c1977 until 2009. The historic bridges are on old approaches to the town, on Old Calder Highway and Arundel Road, both crossing the Maribyrnong River. Overnewton is a reception centre, and north of it, towards the river, is a vineyard, 17 km from Melbourne. The Overnewton Anglican community college (1987) is nearby. It has another campus (1996) in Taylors Lakes. The Keilor municipality was formed when it was proclaimed a shire on 22 December 1871. It was proclaimed a city on 29 April 1961. In 1993 Keilor city’s share of Essendon North was transferred to Essendon city. On 15 December 1994, most of Keilor city was united with most of Sunshine city to form Brimbank city. A small part was added to Hume city and Airport West, Niddrie and Avondale Heights were added to Moonee Valley city.